Because no TV show can ever truly end, we’ve earned a return to Roseanne’s iconic Conner family dinner table. On a conference call with reporters Tuesday, ABC Entertainment chief Channing Dungey confirmed, “We’re rebooting Roseanne,” adding that the new eight-episode revival will air on the network mid-season in 2018. Is your harmonica handy? On April 28, the news broke that show’s original producers had developed a pitch for revival of the nine-season ’90s sitcom, which was being shopped around to various networks. Per ABC, the original cast — John Goodman, Sara Gilbert, Laurie Metcalf, Michael Fishman, and of course Roseanne Barr herself — will all return for the revival. Lecy Goranson will play Becky, while Sarah Chalke, who replaced her in the later seasons, will appear in another role. Roseanne Barr will executive produce, along with Sara Gilbert, Tom Werner, Bruce Helford, Whitney Cummings, and Tony Hernandez. 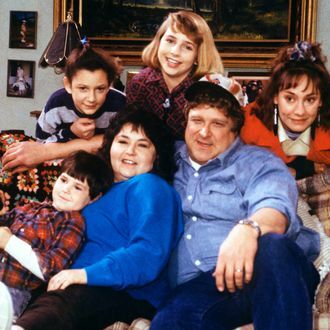 During its first run on ABC, Roseanne was a ratings hit and a cultural touchstone famous for depicting a blue-collar family living in Illinois. Goodman and Gilbert made a sweet reunion spoof in March to give fans a taste of the family they’ve missed, and in 2009 Barr wrote blurbs updating everyone on where each member of the family would be in present day. While we’re here, we’ll suggest a title, because Roseanne: Resurrected sounds pretty good.